The Dedication of the Altar in Israel. Isn't putting an embassy in Jerusalem, itself, dividing the land since the embassy is now U.S. soil? I dont think i would consider jerusalem to be united states soil. If that were so then the russian embassy in washington dc would be russian soil. I believe the property is leased or rented. Some embassies are rented offices. "Contrary to popular belief, most diplomatic missions do not enjoy full extraterritorial status and – in those cases – are not sovereign territory of the represented state. Rather, the premises of diplomatic missions usually remain under the jurisdiction of the host state while being afforded special privileges (such as immunity from most local laws) by the Vienna Convention on Diplomatic Relations. Diplomats themselves still retain full diplomatic immunity, and (as an adherent to the Vienna Convention) the host country may not enter the premises of the mission without permission of the represented country, even to put out a fire. International rules designate an attack on an embassy as an attack on the country it represents.The term "extraterritoriality" is often applied to diplomatic missions, but normally only in this broader sense." Okay, so I guess it would depend on whether or not the embassy in Jerusalem enjoys full "extraterritorial status". This is the verse i understood as the embassy would be moved to jerusalem. This is the verse speaking of the land being devided. I believe this deviding of the land to take place after the peace plan is released.I also believe the old city of jerusalem shall be occupied by some sort of intetnational millitary comprised of gentiles and will occupy the city (as part of the plan)for 42 months before it is attacked and the city taken. Good question. Here is a diagram I did to show this. This above quote comes from the following blog post, which shows that the daily services shall be taken away 1290 days before the placing of the Abomination of Desolation. The following 45 days unto the blessing is, or contains, the Great Tribulation. That is the prophecy of Daniel 12:11-12. Can you give a summary sketch of why you believe next year? Like you I started with Daniel`s numbers, especially 1,335 days. Now that is 1,290 + 30 + 15 days. People are most blessed, scripture tells us, to reach that time. 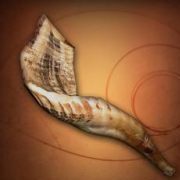 This date I believe is the most blessed time in Israel`s calendar, the time of their victory over the enemy. It is called the feast of Purim, where Esther went into the king for her people, Israel. It is a reminder of national deliverance. Thus after Armageddon, when the Lord delivers Israel`s from all the armies of the nations, then they will be celebrating national deliverance. And that is always on the 15th of the second month of Adar. Israel doubles its last month, (Adar) every three years or so to catch up with the solar calendar. In 2027 there is a double Adar, and thus 7 years before that is 2020. 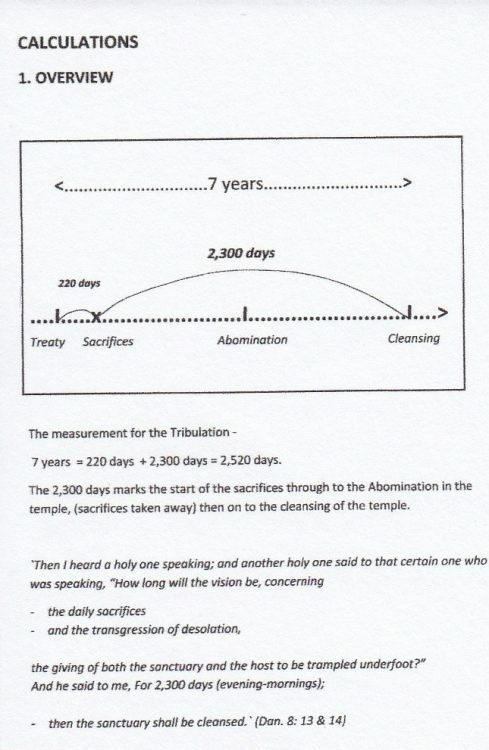 All the other main events of the tribulation fit in with the months during that 7 years. For example, before the Lord comes, (month of Tevet) it is the time of mourning in Israel remembering when Babylon laid siege to them. And this time, (Armageddon) it will be the world`s armies that surround Jerusalem. Then when the Lord comes and the Mount of Olives divides, releasing fresh water, enabling the trees along its banks to grow good fruit, then this is actually the Feast time in Israel of Shevat, the beginning of a new year for trees. Each month has a feast that reveals the fulfilment in the tribulation. Hope that explains it a bit more. Marilyn. Yes, I believe we are on countdown for many reasons and the dedication of the altar, just one of them. Maybe I'm dense, but I don't see anything above that shows why next year is the only possible date. No such thing ever occurred. The enemy is desperately gnawing and gnashing in the throes of iniquity. All the while attempting to justify the unforgivable sin of murder. Should I sell my goods and have everything sold by next year.